My German phrases for travellers introduce you to the common expressions you want to know when you travel around Germany. Learn basic German sentences to use when asking for directions, in hotels and restaurants. With a little knowledge of the language, don't you feel well prepared for your adventures? When you travel in Germany you will certainly ask many questions. In the left box below are the German question words in alphabetical order, while you find some often used and very basic words in the box on the right. Entschuldigung = I am sorry. You also say Entschuldigung when you ask for help or interrupt someone. In this context Entschuldigung means excuse me. Before you get lost in a city, or while driving around Germany, don't be shy and ask someone for the way. To make things easier, you can first ask if the person speaks English... Entschuldigung, sprechen Sie Englisch? However, you want to practise your German language skills, do you? 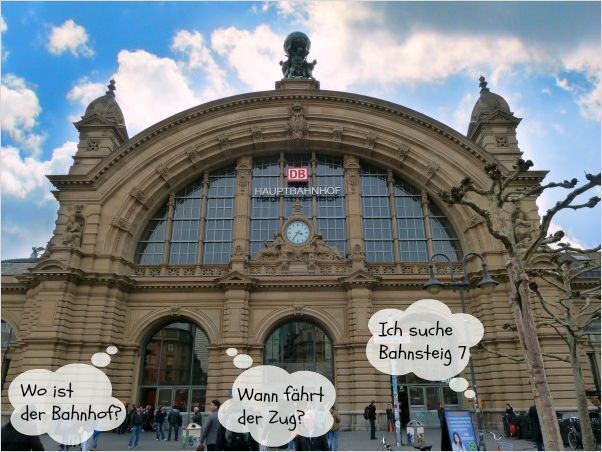 Wo ist der Bahnhof? Where is the train station? Gehen Sie geradeaus, an der nächsten Kreuzung links. Dann sehen Sie den Bahnhof. Go straight ahead, turn left at the next crossroads. You'll see the train station then. Wie komme ich zum Hotel Zur Sonne? How do I get to the hotel Zur Sonne? Ist das die Straße nach Frankfurt? Is this the road to Frankfurt? Wie weit ist es zum Marktplatz / Stadtzentrum ? Kann man laufen? How far is it to the market place / city centre? Can we walk? Von welchem Bahnsteig fährt der Zug nach Berlin? From which platform does the train to Berlin leave? Kann ich eine Fahrkarte im Zug kaufen? Can I buy a ticket in the train? Entschuldigung, können Sie mir helfen? Wie funktioniert der Fahrkartenautomat? Excuse me, can you help me? How does the ticket machine work? Wann fährt der nächste Zug nach München? When does the next train to Munich leave? Bitte einen Fahrschein / Fahrkarte nach Hannover. A ticket to Hanover, please. Do you already understand German? Do you want to improve your speaking skills and learn about everyday life in Germany? My friend Peter is a German teacher, he invites students to become a virtual part of his family. Learn about German life while watching videos, Peter introduces you to his house, his wife and his son. It is easy to learn authentic German at you own pace, you can replay the videos again and again. The videos have German subtitles, a great help just in case you don't understand everything. Subscribe to Peter's free videos. In hotels you will have the least problems to communicate with people in English, especially in the large hotels staff speaks English. Haben Sie ein Doppelzimmer / Einzelzimmer für eine Nacht? Do you have a double / single room for one night? Was kostet das Zimmer mit Frühstück? How much is the room with breakfast? Haben Sie ein billigeres Zimmer? Do you have a cheaper room? Kann ich mit dieser Kreditkarte bezahlen? Can I pay with this credit card? Wo ist der Speisesaal / das Frühstückszimmer? Where is the dining room / breakfast room? Tourist information centres are an useful source of info for travellers. Get brochures of local attractions, book a guided tour to see the city sights and get help finding accommodation. Ich möchte ein Doppelzimmer in einem Hotel im Stadtzentrum buchen. I'd like to book a double room in a hotel located in the city centre. Haben Sie eine Broschüre mit den Attraktionen in der Stadt? Do you have a brochure of the the attractions in the city? Wie lange dauert die Stadtrundfahrt? How long does the city tour take? Haben Sie einen kostenlosen Stadtplan? Do you have a free city map? Wann hat das Museum geöffnet? Wie sind die Öffnungszeiten des Museums? When are the opening hours of the museum? Wo gibt es hier ein typisch deutsches Restaurant? Where is a typical German restaurant around here? Was möchten Sie drinken? What would you like to drink? Ich möchte nur eine Kleinigkeit essen. I'd just like a snack. Gibt es noch etwas warmes zu Essen? Do you still serve hot meals? Was empfehlen Sie mir? / Gibt es ein Tagesmenü? What do you recommend? / Is there a dish of the day? Use the questions below to start a conversation, to get to know people. Vice versa, people will ask you the same, so it is good to know these short German phrases. Woher kommen Sie / Woher kommst Du / Wo wohnen Sie / Wo wohnst Du? Where do you come from / Where do you live? Wie alt sind Sie / Wie alt bist Du? How old are you? Sind Sie zum ersten Mal in Deutschland / Bist Du zum ersten Mal in Deutschland? / Ja, das ist mein erster Besuch hier. Is this your first time in Germany? / Yes, this is my first visit here. Welche Gegend gefällt Ihnen (Dir) am besten? Which region do you like best? When to say Du or Sie?